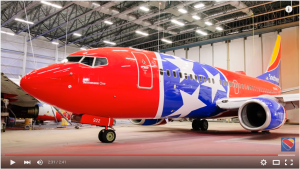 One of the really cool things of Southwest Airlines are how we do our unique plane liveries (i.e. – paint jobs on our aircraft!) As I’ve worked at Southwest, I’ve travelled to airports, and I always get excited when I see one of our special liveries on the ground! I’ve always made a point to take a picture of special livery aircraft the first time I see it somewhere. As I looked for these planes while I was waiting for flights, I wondered–how could I predict where the planes were? Or if I was landing in one of our larger airports (Midway, McCarran, Skyharbor, Orlando, etc), what planes would I see? Were there any heading my way while waiting for a flight? Posted on February 22, 2016, in Off-Topic and tagged Aviation, Southwest Airlines. Bookmark the permalink. 2 Comments. Thanks so much for posting this. I was scouring sites everywhere to find how to locate/book flights that operate on specially-painted planes! Sure thing! Note that the liveries have changed somewhat–we’ve sold a few of the old planes, and replaced them with new ones. Some of the N-numbers have been updated… I’ve tried to update them as best as possible, but there’s some here (like the Arizona One) which have been replaced.